Clean laundry can be complicated. This is your guide to get past all the problems and complications straight to CLEAN every wash! It worked for Grandma, it'll work for me! This is about getting laundry CLEAN, no matter where you wash your laundry. Wash your clothes to get them clean. Sounds simple, right? Pick any subject, even laundry, and you will find unexpected complications lying just below the surface. Everything about laundry has changed since our grandmas were doing laundry, so let's check our assumptions at the door and take a fresh look. Washing machines used to work by filling a large tub with a lot of water then churning the contents to coax the dirt out of the laundry. Clothes swam around submerged in water and soap. Not only has that type of washer gone by the wayside, so have the cleaning products we put in them. Luckily, this is positive change! Let's start with the machines. the old-school machines loaded from the top. They used a lot of water to get the job done. Today, there are a new class of machines that use much less water and less electricity to do their work. We call them high-efficiency (HE) washers. HE Washers are available as top-loaders, and a different style of machine, the front-loader. Those names are descriptive enough to give you an idea of their physical differences, but do those differences matter? The important distinction is whether the machine is HE. All front loaders are HE. When using top-loaders, it is important to pay attention to whether they are HE or the old-style immersion tubs. All of our top-load machines are the old-style non-HE machines. It's important because HE machines, whether they are top or front loading work by using very little water and rely on the tumbling or agitation of the machine more and the action of the water less. An HE label on detergent gives the assurance that you've got a low suds soap. HE turbo delivers a lower level of suds to deliver even better performance in some machines. Notice that the HE graphics suggest it is OK to use your HE detergents in both modern and old-style machines. Just to be clear, it is OK to use HE detergents in old-style washers, but it is not OK to use the old-style soaps or detergents in HE machines. To summarize: HE machines use lots of space for tumbling action and very little water. When loaded properly, an HE washer can look pretty empty and dry compared to the old submersion machines, but with the right load and the right detergent, it works better! We often use the words interchangeably, but are they really the same? Short answer, no. Soaps came on the scene first. They are fats cooked with a chemical base like lye (think of it as the opposite of acid). We learned that crude chemistry long ago. Detergents are a chemical evolution that has been happening as an improvement over soap. They are engineered to address the shortcomings of soap. Detergents work better in hard water, they work better in cold water, they have better surfactant action (the ability to lift out dirt), and they have enzymes that dissolve organic stains (inspired by studying our own digestive systems!) It is an ongoing evolution, with improvements in performance and environmental impact at every step. Soaps tend to leave residue and react with natural minerals in water resulting in dingy laundry that never quite comes clean. Know the machine you are using. Is it HE? Does it have special dispensers for different laundry products -- bleach, detergent, fabric softener. Only load special dispensers with their intended product. Use liquid detergent in HE washers for best results. Never mix different product types in the same dispenser! Never mix liquid detergent and dry detergent in a detergent dispenser. Use one or the other. Never overfill dispensers! Overfilling can release product at the wrong time and do harm to your laundry (especially in the case of bleach.) Not to mention you will most certainly be using too much product! Never over-stuff a front-load washer. When it is 3/4 full with dry laundry, that is FULL. Also, abide by the weight rating on the machine. If you reach your weight limit before you fill the drum 3/4 of the way, then weight trumps fill level. Empty pockets in your clothing before washing! Zip up all zippers! (open zippers can catch, tear or abrade laundry in the tumbling action of the washing machine. Check the machines before using them. You may find crayons, pens, markers or foreign substances carelessly left in pockets (remember that rule?) by the previous user. Don't use fabric softener on everything! It can impair your towels' ability to absorb water. Sort laundry by type and color. Yes, we still need to do that. Let's dig a little deeper into this subject. We'll elaborate on some of the good practices above while we go through the process of doing laundry step by step. 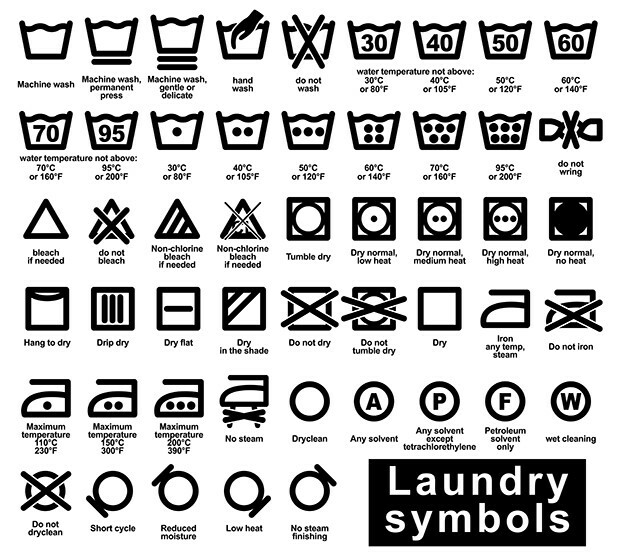 Ever see one of these symbols on your clothing tags? This is a legend of standard laundry instructions graphics found on clothing tags. Let it guide you in selecting water temperature, wash cycle type, and dryer settings. Want the best results? Sort and separate your clothes. It might surprise you that HE washers can actually exacerbate color bleed problems. Because there is less water, laundry items spend more time in direct contact with each other and the cycle times are longer than old-style washing machines. So, it is especially important to sort and separate if you are using an HE machine. Separate your laundry into these categories and do each category as a separate load with the proper laundry conditions and products for that particular load. That means using the right water temperature, wash cycle type, detergent, softener, bleach, etc. DARKS saturated intense colors. These might bleed into the lighter wash. Dyes in clothing vary in their color fastness. Why take a chance? DELICATES lace, silk or satin garments or bedding. Athletic clothes like running shorts or tights and cycling clothes last longer if treated as delicates. These usually have their own special requirements that make them a category unto themselves. Fabric type trumps color, so if you have a white delicate, it gets the delicate treatment! (optional) LINT If you are having a problem with a lot of lint clinging to some clothes, you may want to separate the lint producers from the lint attractors. Lint producers are things like sweatshirts, towels, flannels. Lint attractors are things like nylon blouses, microfibers, and lightweight athletic clothing. The lint attractors can be washed with delicates and lint producers that are not white are best washed with darks. No time or patience for sorting or Pre-Soak? If you are using an HE machine, do not think you will improve the wash outcome by just adding more detergent. That will make matters worse. Always use the optimal amount of detergent based on load size and detergent manufacturer recommendation. Adding just a little extra for dirty loads, is OK, but if you use too much detergent in an HE machine, it will leave residue that does not rinse out and that will result in laundry that is not as clean, attracts dirt, and may irritate skin and eyes. OK, we got some bad news while sorting. We found some very stained items in the sort and set them aside. Spray them with a stain remover product and give it at least 10 minutes to do its work (longer is better). If some items have more than just spotty stains, a pre-soak is in order. In a tub or a bucket, mix some laundry detergent with water at a concentration similar to a wash load. Add the clothes to the water and adjust to make sure they are covered. Let them soak for at least 20 minutes. Remove them. Wring them out lightly then add them to the appropriate wash load with your other laundry. Yes, this is a pain, it takes more time, but it is the most effective way to get your laundry CLEAN. You might be tempted to add a little extra detergent in the wash and just throw the stained or very soiled items in with the rest of the laundry without pre-soaking, but that will produce disappointing results compared to a proper pre-soak. Machine capacity: 1 standard load = 10lbs, so a 40 lb machine is a 4 load machine. In HE multi-load machines, use one tablespoon of standard HE liquid per 10 lbs capacity for a full load. First, pick the right machine. Front-loaders come in many sizes. You should never fill a front-load machine more than 3/4 full with dry laundry. Fill it with more and it can't clean. It needs that tumble room. So, with that knowledge, load the dry clothes into the drum. Next, measure your detergent and optional products into their respective dispensers. Use the right amount based on the number of loads (some of our machines will handle up to 10 loads) and the amount of laundry in the drum. You will have to use some judgment on this, but getting close enough is actually pretty easy. Suppose we have a 40 lb washer halfway full. Remember, a 3/4 full drum would be the full 4 loads, so if you are half full, that is about 3 standard loads of wash. You would use enough detergent for 3 loads. If you are using a standard HE detergent, you will use 3 tablespoons for that load. Simple, and think of the money you'll save on detergent! Whether it is a top-loader or front-loader, do not over-stuff the machine. This is especially important in HE machines. They rely on giving laundry the room to tumble and roll about; that action is what cleans the clothes. If the clothes don't have room, they don't get cleaned and you waste your time and money on that load. When using a front-load HE machine, liquid detergent works best. Even if a dry powder detergent has an HE label, the liquids outperform it. The powder particles scatter and cake inside the machine before they dissolve. If you must use a powder detergent in a front-loader, put it directly into the drum with the clothes. Finally, select the right type of wash cycle and water temperature for that load. Generally, LIGHTS will be washed in hot, DARKS and LINT PRODUCERS will be washed in cold, DELICATES and LINT ATTRACTORS will be washed in cold. LIGHTS, DARKS and LINT PRODUCERS all benefit from a regular wash cycle. DELICATES and LINT ATTRACTORS should be washed on a delicate cycle if it is available. All of our top-load machines are non-HE. They are also single standard load. These machines work on the old principle of using a lot of water and some agitation. We make them available because some people prefer them, but if you are concerned about the environmental impact of your wash or if you want the cleanest possible wash, we recommend that you try using our HE machines and following the directions above for the best results. First, select the right type of wash cycle and water temperature for that load. Generally, LIGHTS will be washed in hot, DARKS and LINT PRODUCERS will be washed in cold, DELICATES and LINT ATTRACTORS will be washed in cold. LIGHTS, DARKS and LINT PRODUCERS all benefit from a regular wash cycle. DELICATES and LINT ATTRACTORS should be washed on a delicate cycle if it is available. Next, if available, select the right water level for your wash load. add the detergent (follow directions on your box or bottle) to the tub and start filling the tub with water. Add the laundry. Again, only fill the tub 3/4 to the top with dry clothes. That's a full load. Follow instructions on the machine for additional products like softener and bleach. Our commercial dryers are very large and very powerful. Even so, over-filling will just result in poor performance. Clothes need room to tumble to dry properly. If you are filling the dryer more than halfway, it's time to start filling a second dryer. Look at those labels and dry appropriately. In general, cotton, linens, and denim can be dried on the high heat setting. Delicates on low or tumble dry only. Whew! That was a lot of information! Come back to this post to refresh your memory. Understand it and never make a laundry mistake again! Up next we have actual product reviews, a discussion about extra-strength detergent formulas, and some more detailed dosing advice, and finally, the perfect LAUNDRY CHEAT SHEET to put the laundry basics at your fingertips! Either on your phone or printed out.